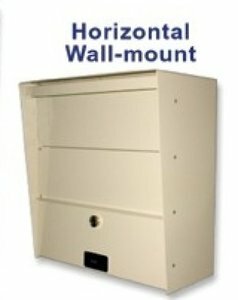 The Letter Locker Horizontal wall mount mail box is made of 14 and 16 gauge electro-galvanized steel, then finished in a powder coat paint. It is available in Textured Black, White, Gray, Tan or Bronze. The standard lock uses a stainless steel hook cam. Level 2, the “CLAW” is a 5 point locking mechanism that includes 4 stainless steel claws that rotate into the door bracket. Level 3 adds the key control, pick & drill resistance of a high security Medeco lock to the Claw for the ultimate in security!